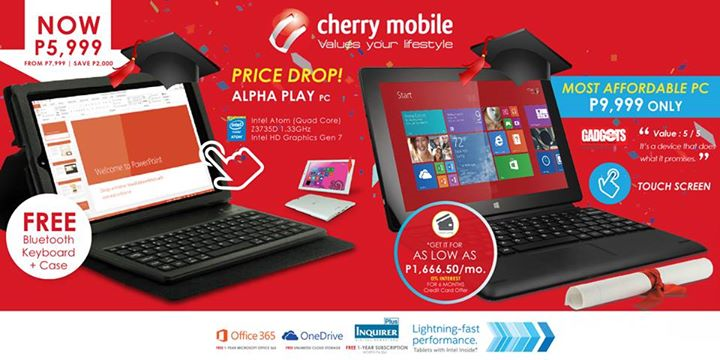 Home Tablets [PRICE DROP] Cherry Mobile Alpha PC Series: The personal computer you can afford! [PRICE DROP] Cherry Mobile Alpha PC Series: The personal computer you can afford! Get the discounted Alpha Play for Php 5,999 (before: Php7,999) and the Alpha Morph for Php9,999 (Before: Php11,999) or 6 easy payments of 1,666.50 at 0% interest rate! Just visit any of these participating Cherry Mobile concept stores and kiosks after the jump. SM Cebu, Cyberzone Area "lounge type"